We recently got to a look at the Tennessee Titans’ and Jacksonville Jaguars’ new uniforms as they changed out their game day wear. As someone who has long-wished for the Falcons to make a change, the move inspired me to give a brief history of the Falcons past uniforms. It’s unclear if the Falcons will make a change anytime soon, and considering what Nike has done for most teams, it may be for the better that we don’t change up our look. 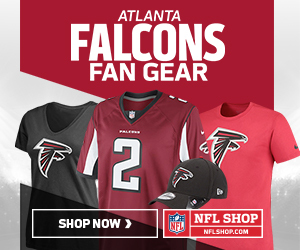 The 1966 Atlanta Falcons season was the franchise’s inaugural season in the National Football League. At the time, our uniforms were very unique to the others in the league. As shown above, we had black jerseys with white numbers, white pants, and red helmets. They were very similar to the throwback uniforms which were worn by the Falcons when Tony Gonzalez was with the team. If you notice, the Falcons helmet had a thin, gold stripe on it. Why you ask? Apparently, the fine folks at the Georgia Institute of Technology were angry that the Falcons looked like the University of Georgia’s football team. To fix everything, the Falcons wore a two thin gold stripes on their helmets from 1966-1969. Out with the black, in with the red! The 1971 season brought the first major uniform change for the Atlanta Falcons, with the addition of red uniforms. Some say this is the best look in Falcons history, they may not be wrong. The road uniforms basically remained the same, but they reversed the home colors from black to red. Atlanta wore these uniforms well into the late 1970’s. Silver was introduced in 1978, as the Falcons pants switched from white to silver, as shown above. I personally like the addition of silver, and it lasted in the Falcons color scheme up into 2002 the season. Also, the collar stripes became more detailed, and the road uniforms had red numbers instead of black, which had been the case since the teams’ inaugural season. This uniform is likely best remembered by older Falcons fans, as the team had its best season up to that point, going 12-4 in 1980. In 1984 the Falcons switched to black facemasks, which has been the case ever since. The new decade brought a new change to the Atlanta Falcons, the reintroducing of black as the primary color. The Falcons returned to having black jerseys as their home uniform, but this time, they had black helmets to go with them. Red was basically stomped out, as the only red that was visible came by way of thin stripes on the pants and on the numbers. The away jersey for the Falcons even had black numbers now, with black socks. The look started the Falcons in a new direction uniforms-wise, that would be upgraded down the road. As I became a fan only a year earlier (when I was six years old), this was the Atlanta Falcons to me. The Falcons improved on the 1990’s Falcons-look, with the reintroducing of red to the away uniforms. The home uniforms practically remained the same, but the away jerseys returned to having red numbers and red socks. The Falcons had their most success up to that point while wearing these uniforms, by not only making their first Super Bowl, but also being the first NFL team to win a playoff game on the road at Lambeau Field. Safe to say, these uniforms hold a special place in the heart of all Falcons fans. The Falcons took advantage of the recent success to revolutionize their uniforms. The Falcons not only created a new, modernized logo, but also got completely new uniforms as well. Also for the first time in their history, the Falcons had an alternate jersey, switching between red and black. Although red would ultimately win out as witnessed by the present-day Falcons, the black uniform is something fans still dream about. Another look that had a short run was the Falcons black pants. They were stylish, and clean, but disappeared into Falcons history following the 2008 season. The Falcons 2009 season they went back to basics. They kept the 2003 look, but ditched their all-black alternate uniform, and replaced it with a 1966 throwback. Since then, the team has remotely stayed the same, minus a few tweaks, such as alterations to the collar, for the 2017 season. Now the debate begins, should we consider an update to our current uniforms, or a complete overhaul? If you’d like to discuss the future of the Atlanta Falcons’ uniforms, or just want to chat, you can reach me on Twitter at @EvanBirchfield.